Milk and Dark Assorted Chocolates. caramel, fruit. maple and coconut cream. coating over 15 different centers. milk, one dark bitter-sweet chocolate. nougat centers . . 12 varieties. ing over nutty centers. 1Y2-lb. box. lates. :\o cyclamates. 9-oz. box. 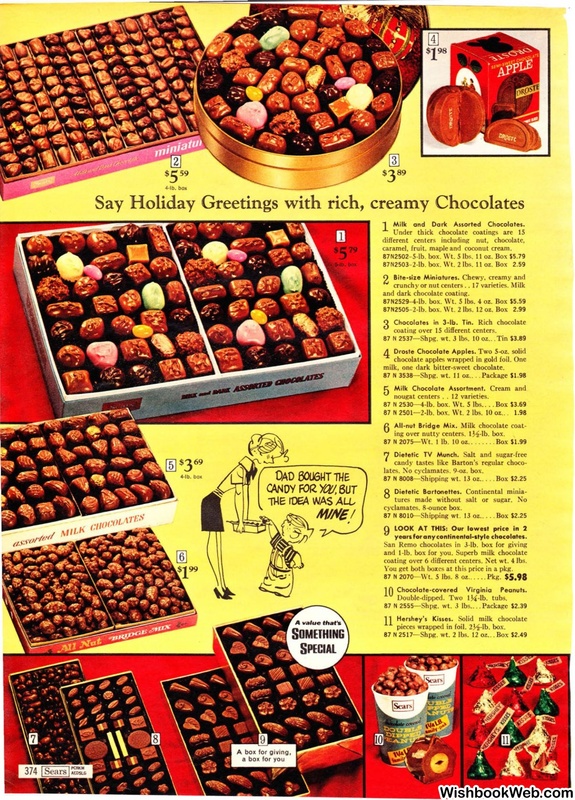 yeors for any continental-style chocolates. coating over 6 different centers. Net wt. 4 lbs. You get both boxes at this price in a pkg. 87 N2070-\\'t. 5 lbs. 8 oz... .. .Pkg. pieces wrapped in foil. 27\!-lb. box.